These are some of the questions posed by MINI’s passionate fan community in the company’s #asktheNEWMINI campaign. Positioned as an online “meet & greet” for the new MINI, fans are encouraged to submit questions across Facebook, Twitter, Instagram and Google+. The company then selects ten questions weekly for the new MINI to answer in a 15-second video filled with vrooms, tire marks, close-ups on features and even the occasional cheekiness (e.g. twerking) for good measure. According to the company’s blog, the videos are shot in a 3000 square meter airplane hangar in Munich. There is a ten-person creative team on site and it takes about a week to go from selecting the fan query to having a final video ready for its debut. MINI is one of those “love brands” that is lucky to have a highly passionate fan community. But, more importantly – MINI has taken the time to get to know their community of “MINIacs” and what they’re interested in. The company regularly features fan photos and curates content across its social media sties related to the lifestyle and personality of its community. As a result, it makes sense to introduce the new MINI with a campaign that’s dedicated to answering their questions in an educational and fun way. Videos serve as engaging Q&A story vignettes. Video was a good medium for bringing this campaign to life. While the new MINI doesn’t actually speak, each video serves as a 15-second story to answer a fan’s question. The questions are shown at the beginning of each video and then the answer is brought to life with a mix of fun, facts, action and the occasional prop. Sounds, such as music, vrooms and tires screeching also add a lot to each video answer. The content is fan centric vs. sales centric. It would be very easy to turn this campaign into a series of 15-second advertisements doting on each new feature of the car. Instead, the MINI team took a different approach by crafting story responses to quirky and cheeky questions in a way that also showcased the car and its new features. From how fans can afford the car, to the MINI twerking, or a stunt driver drawing a heart with tire marks, the videos let the MINI’s personality shine. MINI is maximizing audience reach with cross-platform content distribution. While the campaign is hosted across the company’s Facebook, Twitter, Instagram, Pinterest and Google+ communities, the team at MINI has been smart to tap into the unique features of the different platforms for efficiencies and to maximize reach. For example, all of the video responses are created for the 15-second Instagram environment, while Twitter encourages ongoing question submissions. Facebook hosts a tab aggregating all of the video content from Instagram to date, plus encourages question submissions. 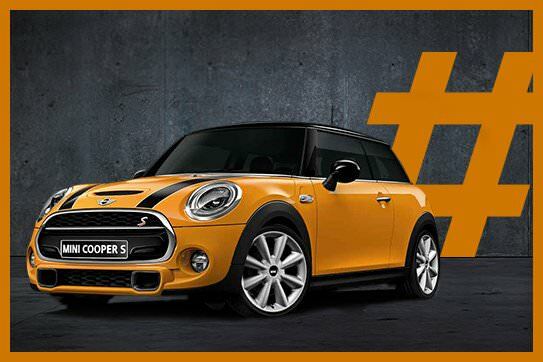 All pins in the #asktheNEWMINI board on Pinterest drive traffic back to the campaign’s Facebook tab. Have a question to ask the new MINI? There’s still time! The campaign runs through June 2nd.